Each year, Fairfax hosts Fairfax History Day, focused on local 19th century life. With all of the rain we've been having recently, we were fortunate to have a beautiful, sunny spring day. It is held at 'Historic Blenheim', a former plantation near the site of the first battle of the Civil War. The union soldiers quickly evicted the family from their home and turned it into a camp for the soldiers as they prepared for the Battle of Bull Run. The home at the center of the plantation, now known as 'Graffiti House', had been recently built and had clean, bare walls. The union soldiers covered the clean, white walls with their signatures and with graffiti. Recently, the city acquired the property and began the process of renovation and exposing the original graffiti on the walls. In addition to tours of the house, exhibits were setup to help us learn more about local people and life. The kids loved the blacksmith display and learned so much from the passionate volunteers. Thursday, April 26 was National Bring Your Child to Work Day. Carson and Tucker commuted with me, walking to the subway station, then taking the subway downtown, then walking to the office. Savannah was so disappointed that she was sick and couldn't go with us. We were greeted by a table of candies and chips. Without me asking, the boys sat down at a table near my desk and started their studies for the day. The company provided pizza for lunch; cupcakes for an afternoon snack, and they even hosted a lesson on 'Impact Investing' for the kids. The kids had a good time and it was good for them to get a view into my work. Unfortunately, Barbie was in a catastrophic accident. So Savannah and I performed an emergency cranial transplant. We tied some paracord to the loop inside the head, then used JB Weld to secure it to the inner neck. We'll have to see how well it holds up. Savannah says, "it broke because Tucker and I were pulling her head too hard and her head popped off! I really missed her. It took us one week to fix Stacey's head." There are thousands of tulips in bloom in front of the house. a little frog we saw by a little pond by the front of the house. 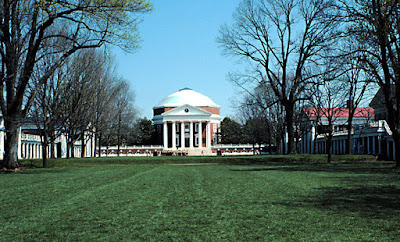 We drove to Charlottesville to walk around the University of Virginia, the school that Thomas Jefferson built. This area is called 'The Range'. Both sides are rooms for graduate students. Because it's all original buildings from the 1800s, there's no air conditioning. For winter, each room has a radiator and a fireplace. We walked by these rooms, (which all face out to this grassy quad area) and there was firewood sitting outside most rooms. All the rooms still have functional fireplaces and students can buy firewood. Very unique for a modern university. These structures behind Carson and Savannah are the original buildings. 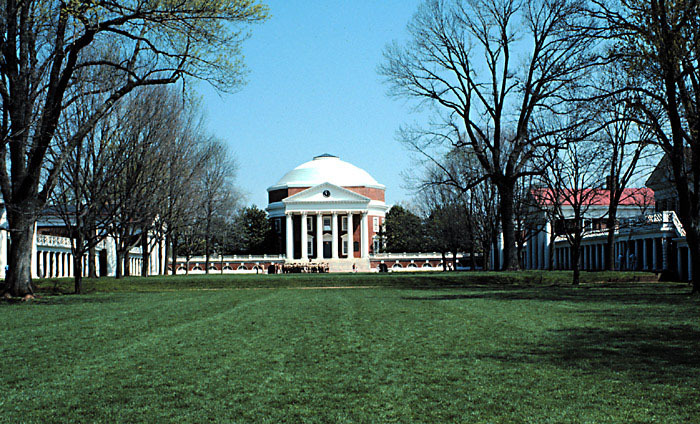 The main library (first picture) looks a lot like the rotunda style of his Monticello home. This is inside what used to be the main library for the university. Now, it just has meeting rooms and study space.